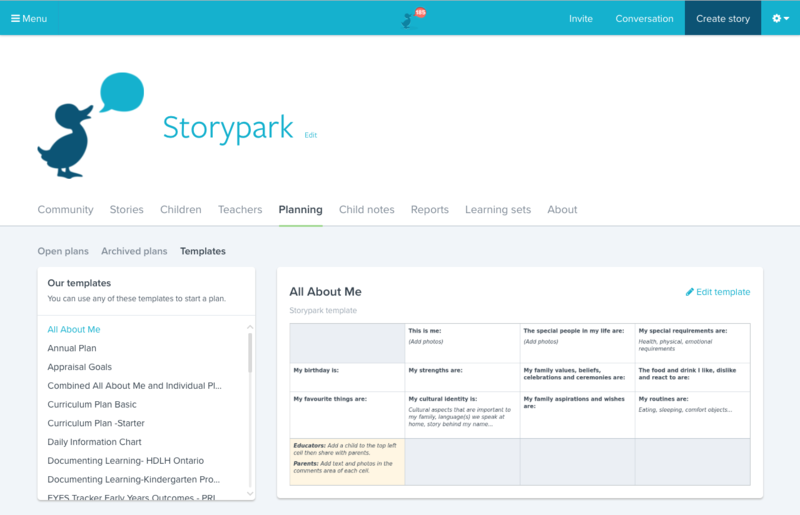 A planning template is a Storypark plan that is pre-populated with regularly used content, from which teachers can start a new plan. Templates are designed to save your teams' time so they don't have to start from a blank page every time they want to create a plan. You may wish to create network-specific templates so that all your services are planning in a consistent way or to embed best practice across your network. 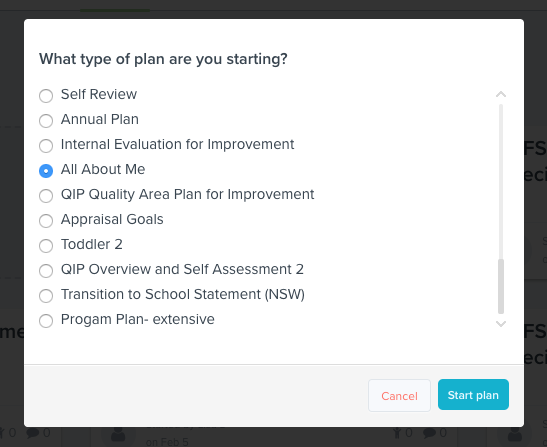 The planning templates you create in your head office and select in your network setup will be available for teachers across all your services to start new plans from. To create and edit your network planning templates go to your head office service's 'Planning' page. 1. Create a new plan or open a plan you wish to adapt. Learn how to a start a plan here. 2. Add any headers and content to your plan. Learn how to build your plan here and move things around in your plan here. 3. Once your plan is ready it's time to turn it into a template. Click Save template in the top right menu bar and give your new template a name. Learn more about creating planning templates. 4. 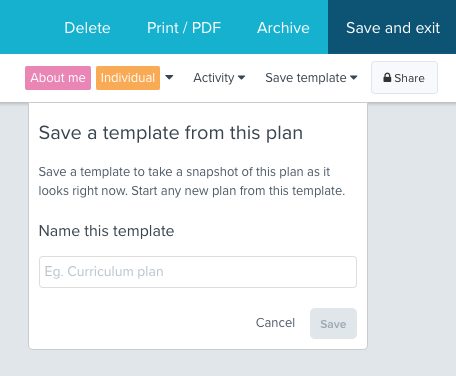 View any templates you've created on your 'Templates' page under 'Our templates'. You can click on any of your template names in the left-hand list to view a snapshot of it on the right. Your network setup 'Planning templates' page lets you select the network planning templates you wish to make active across all your services. The bottom left list, 'All templates' displays all planning templates listed in your head office and can only be seen by network administrators (see the 'Create network planning templates in your head office' section above to learn more). You can select templates from this list that you want to apply or 'make active' across all your services. The top left list, 'Active templates', displays all sets that you've made active. These templates can be seen and used by all your services. The area on the right displays the template name, the status (Active or Inactive) a snapshot of what the template looks like, a button to add or remove the template to/from all services, and a message that lets you know if an active template has been changed and needs updating. 1. Select the template name in the bottom left list under 'All templates' and click the 'Add to all services' button on the right. You'll be asked if you're sure, and once you confirm, you'll see your template listed on the left under 'Active templates'. It can now be seen and used by all your services. Once a network template has been activated it is available to all your services. Now, whenever a teacher creates a new plan, they will see any network templates you've activated in the displayed list. Note: If a service wants to create their own version of your network template, ie. 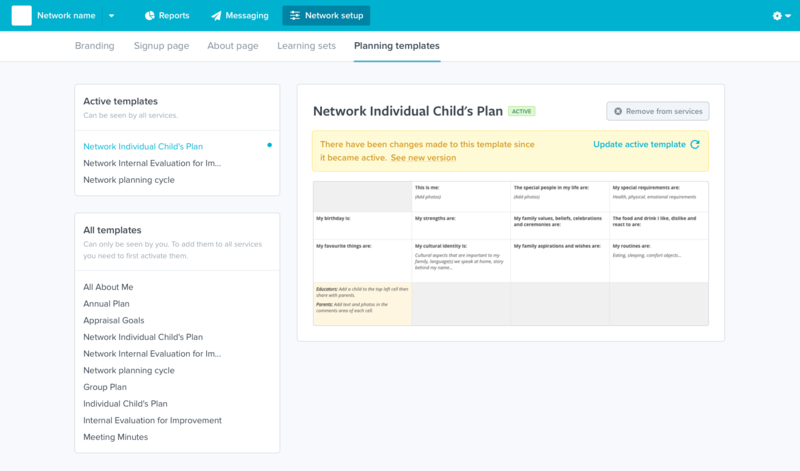 if they wish to personalise it by adding their children or links to it, they can start a plan from the network template, make any personalised changes to the plan and then save this as a new template with a different name. This new template will be their own personal template, not a network template any longer and any subsequent changes you make to the network templates will not affect it. At times you may wish to change or update one of your templates to bring it into line with latest thinking, curriculum changes or best practice. You can make changes to any of your templates in your head office service without affecting the active template that all your services are using. 1. Edit your template in your head office service. See the 'Create network planning templates in your head office' section above, or read our learn how to edit a plan help centre article. 2. When you've finished making changes go to your network setup Planning templates page. You'll need to refresh this page to see your changes. If you don't see any changes, try refreshing again as it may take a few moments for the changes to be reflected on this page. 3. You'll now see a blue dot next to the active version of your updated template and a yellow message beneath the title showing that there have been changes made since it became active, and that the active one your services are using is an old version. 4. You can see the latest version by clicking 'See new version' in the yellow panel. Keep clicking this link to toggle between the two versions. You can see what changes have been made in the snapshot below the yellow panel. 5. 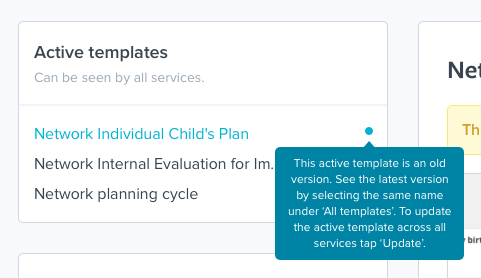 To reflect your changes in the active template across all services tap the blue ‘Update active template’ link to the right. Why am I seeing a blue dot next to my template? A blue dot signifies that someone has made changes to a template. Please read the section above 'Updating a template' to learn more. Select the template name in the bottom left list under 'All templates' and click the 'Remove from all services' button on the right. You'll be asked if you're sure, and once you confirm, you'll see your template disappear from the 'Active templates' list to the left. It now can't be seen or used by any of your services. You're template will still be available in your head office and be listed under 'All templates' so you can choose to activate it again at any time.